Today we celebrate the advent of the Bhagavad-gita, or the day that Sri Bhagavad-gita was spoken by Lord Krishna to his dearmost devotee and friend Arjuna,at the place known as Kurukshetra. We happened upon a nice post, which is a summary of the 18 chapters of Bhagavad-gita, on the Sampradaya Sun, followed by the Sri Gita Mahatmya, which is chanted after the recitation of the Gita, and we share it with you today. The summaries of chapters 9,11,12,13,14,15,16,17 & 18 are directly taken from the BG study guide of HG Gauri prabhu of Vrindavan Gurukul. The other chapters 1, 2, 3, 4, 5, 6, 7, 8, 10 were compiled by Subala prabhu, who compiled the entire study overview for the devotees of the Bhagavad Gita Forum. The Advent of Sri Bhagavad-gita is observed on this day. Traditionally This is the anniversary day commemorating the day that Srimad Bhagavad-gita was spoken by Lord Sri Krishna to His dearmost devotee Arjuna at the place now known as Jyotisar Tirtha, amid the warring families of the Kurus and the Pandavas at Kurukshetra. One can still visit that place and see the monument erected there with Krishna as Parthasarati (the chariot driver) and Arjuna the warrior on their chariot. It is claimed by the ashram who maintains the shrine that the tree next to Them is a continuum growth of the original tree witness that was there at the actual day of speaking. Traditionally, devotees come to Kurukshetra (Dharmakshetra) and recite Bhagavad-gita from early morning until the next morning, perform arati to Bhagavad-gita and to Krishna and Arjuna upon the chariot, offer lamps, ‘dheep daan’, at Brahma Sarovar, and give shloka recitals, shobha yatras and seminars on the significance of the Gita today. 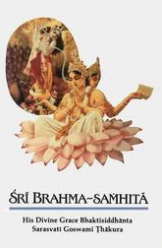 Devotees who cannot get to Jyotisar Tirtha remember the blessed event by reciting Bhagavad-gita, performing Bhagavad-gita ahuti of each verse or selected chapters into the sacred fire, and discussing the subject matter of Bhagavad-gita in the association of devotees. Distribution of Bhagavad-gita As It Is on this day is a very auspicious activity to perform. I have always found this story of the disrobing of Draupadī, the wife of the godly King Yudhiṣṭhira, to be and example of how Krsna always protects his pure devotees. This incident contributes greatly to the Great Battle of Kurukṣetra, which almost completely annihilated the Kuru’s. And is a very good example of Spiritual Blindness. The following is a few select verses from the Srimad-Bhagavatam and Bhagavad-gita As It Is. 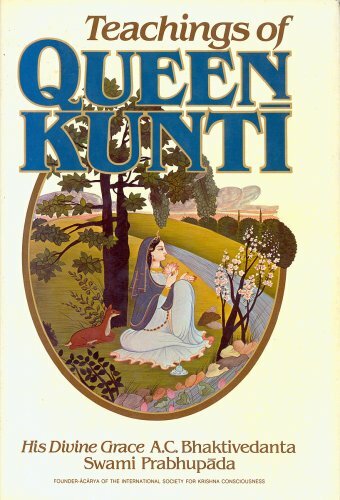 …Here Kuntī remembers all the dangers through which she passed before the Pāṇḍavas regained their kingdom. In Bhagavad-gītā Lord Kṛṣṇa says, kaunteya pratijānīhi na me bhaktaḥ praṇaśyati: “My dear Arjuna, you may declare to the world that My devotee is never vanquished.” The Pāṇḍavas, the sons of Pāṇḍu, were great devotees of Lord Kṛṣṇa, but because people in the material world are interested in material things, the Pāṇḍavas were put into many dangers. Their materialistic uncle Dhṛtarāṣṭra was always planning to kill them and usurp the kingdom for his own sons. That was his policy from the very beginning. My dear Kṛṣṇa, Your Lordship has protected us from a poisoned cake, from a great fire, from cannibals, from the vicious assembly, from sufferings during our exile in the forest, and from the battle where great generals fought. And now You have saved us from the weapon of Aśvatthāmā. The list of dangerous encounters is submitted herein. 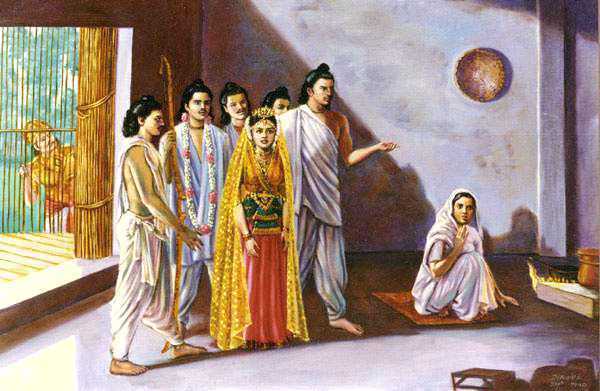 Devakī was once put into difficulty by her envious brother, otherwise she was well. But Kuntīdevī and her sons were put into one difficulty after another for years and years together. They were put into trouble by Duryodhana and his party due to the kingdom, and each and every time the sons of Kuntī were saved by the Lord. Once Bhīma was administered poison in a cake, once they were put into the house made of shellac and set afire, and once Draupadī was dragged out, and attempts were made to insult her by stripping her naked in the vicious assembly of the Kurus. 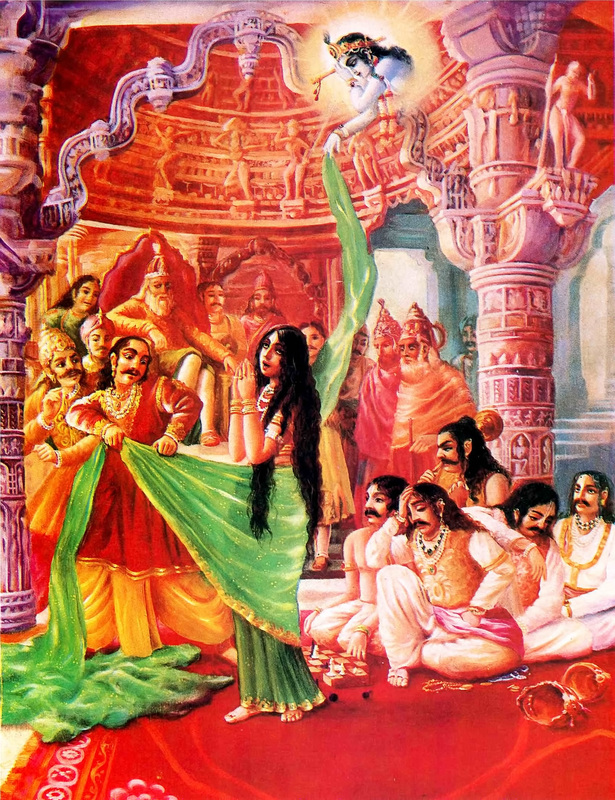 The Lord saved Draupadī by supplying an immeasurable length of cloth, and Duryodhana’s party failed to see her naked. Similarly, when they were exiled in the forest, Bhīma had to fight with the man-eater demon Hiḍimba Rākṣasa, but the Lord saved him. So it was not finished there. 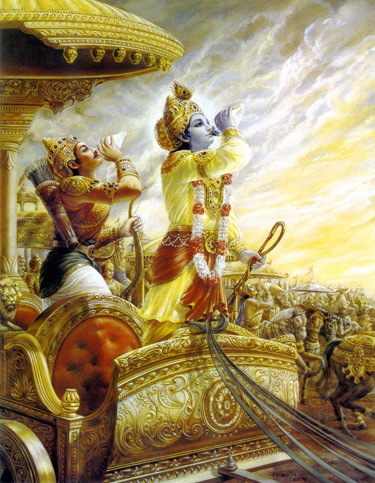 After all these tribulations, there was the great Battle of Kurukṣetra, and Arjuna had to meet such great generals as Droṇa, Bhīṣma, and Karṇa, all powerful fighters. And at last, even when everything was done away with, there was the brahmāstra released by the son of Droṇācārya to kill the child within the womb of Uttarā, and so the Lord saved the only surviving descendant of the Kurus, Mahārāja Parīkṣit. Duryodhana clearly felt that the victory of the Kurus depended on the presence of Bhīṣmadeva. 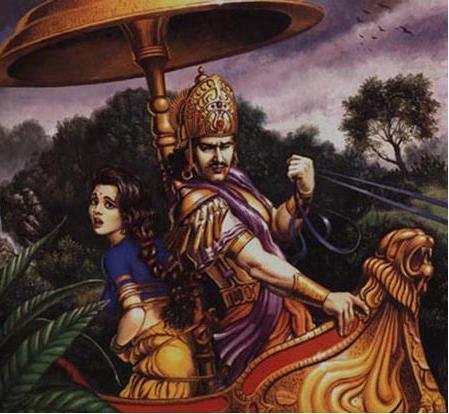 He was confident of the full support of Bhīṣmadeva and Droṇācārya in the battle because he well knew that they did not even speak a word when Arjuna’s wife Draupadī, in her helpless condition, had appealed to them for justice while she was being forced to strip naked in the presence of all the great generals in the assembly. …it is already concluded that all of them would die in the Battle of Kurukṣetra for joining the party of the sinful Duryodhana. Duryodhana was, of course, confident of his victory on account of the above-mentioned combined strength of his friends. Dhṛtarāṣṭra said: O Sañjaya, after assembling in the place of pilgrimage at Kurukṣetra, what did my sons and the sons of Pāṇḍu do, being desirous to fight? Bhagavad-gītā is the widely read theistic science summarized in the Gītā-māhātmya (Glorification of the Gītā). There it says that one should read Bhagavad-gītā very scrutinizingly with the help of a person who is a devotee of Śrī Kṛṣṇa and try to understand it without personally motivated interpretations. The example of clear understanding is there in the Bhagavad-gītā itself, in the way the teaching is understood by Arjuna, who heard the Gītā directly from the Lord. If someone is fortunate enough to understand Bhagavad-gītā in that line of disciplic succession, without motivated interpretation, then he surpasses all studies of Vedic wisdom, and all scriptures of the world. One will find in the Bhagavad-gītā all that is contained in other scriptures, but the reader will also find things which are not to be found elsewhere. That is the specific standard of the Gītā. It is the perfect theistic science because it is directly spoken by the Supreme Personality of Godhead, Lord Śrī Kṛṣṇa. The topics discussed by Dhṛtarāṣṭra and Sañjaya, as described in the Mahābhārata, form the basic principle for this great philosophy. It is understood that this philosophy evolved on the Battlefield of Kurukṣetra, which is a sacred place of pilgrimage from the immemorial time of the Vedic age. It was spoken by the Lord when He was present personally on this planet for the guidance of mankind. The word dharma-kṣetra (a place where religious rituals are performed) is significant because, on the Battlefield of Kurukṣetra, the Supreme Personality of Godhead was present on the side of Arjuna. Dhṛtarāṣṭra, the father of the Kurus, was highly doubtful about the possibility of his sons’ ultimate victory. In his doubt, he inquired from his secretary Sañjaya, “What did my sons and the sons of Pāṇḍu do?” He was confident that both his sons and the sons of his younger brother Pāṇḍu were assembled in that Field of Kurukṣetra for a determined engagement of the war. Still, his inquiry is significant. He did not want a compromise between the cousins and brothers, and he wanted to be sure of the fate of his sons on the battlefield. Because the battle was arranged to be fought at Kurukṣetra, which is mentioned elsewhere in the Vedas as a place of worship—even for the denizens of heaven—Dhṛtarāṣṭra became very fearful about the influence of the holy place on the outcome of the battle. He knew very well that this would influence Arjuna and the sons of Pāṇḍu favorably, because by nature they were all virtuous. 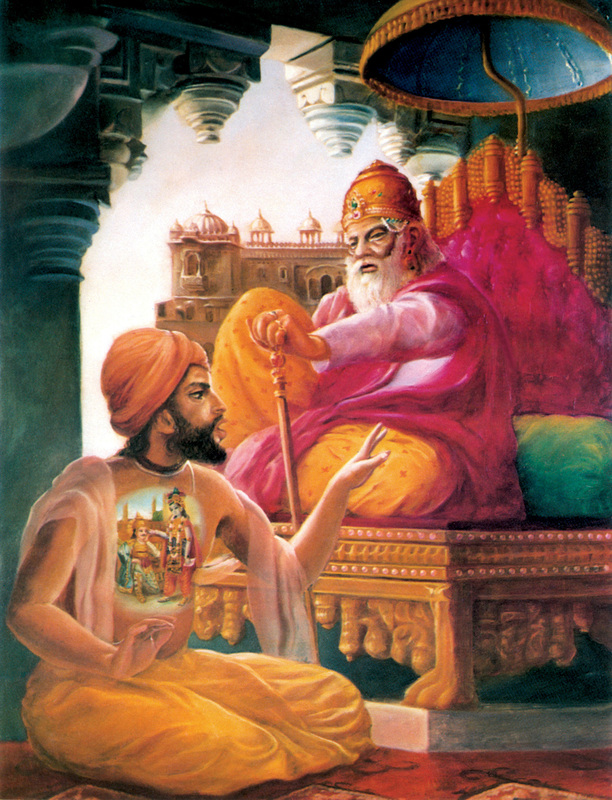 Sañjaya was a student of Vyāsa, and therefore, by the mercy of Vyāsa, Sañjaya was able to envision the Battlefield of Kurukṣetra even while he was in the room of Dhṛtarāṣṭra. And so, Dhṛtarāṣṭra asked him about the situation on the battlefield. Both the Pāṇḍavas and the sons of Dhṛtarāṣṭra belong to the same family, but Dhṛtarāṣṭra’s mind is disclosed herein. He deliberately claimed only his sons as Kurus, and he separated the sons of Pāṇḍu from the family heritage. One can thus understand the specific position of Dhṛtarāṣṭra in his relationship with his nephews, the sons of Pāṇḍu. As in the paddy field the unnecessary plants are taken out, so it is expected from the very beginning of these topics that in the religious field of Kurukṣetra where the father of religion, Śrī Kṛṣṇa, was present, the unwanted plants like Dhṛtarāṣṭra’s son Duryodhana and others would be wiped out and the thoroughly religious persons, headed by Yudhiṣṭhira, would be established by the Lord. This is the significance of the words dharma-kṣetre and kuru-kṣetre, apart from their historical and Vedic importance. On the other side, both Lord Kṛṣṇa and Arjuna, stationed on a great chariot drawn by white horses, sounded their transcendental conchshells. In contrast with the conchshell blown by Bhīṣmadeva, the conchshells in the hands of Kṛṣṇa and Arjuna are described as transcendental. The sounding of the transcendental conchshells indicated that there was no hope of victory for the other side because Kṛṣṇa was on the side of the Pāṇḍavas. Jayas tu pāṇḍu-putrāṇāṁ yeṣāṁ pakṣe janārdanaḥ. 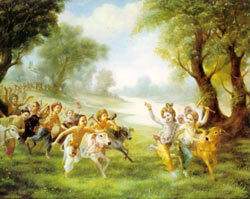 Victory is always with persons like the sons of Pāṇḍu because Lord Kṛṣṇa is associated with them. And whenever and wherever the Lord is present, the goddess of fortune is also there because the goddess of fortune never lives alone without her husband. Therefore, victory and fortune were awaiting Arjuna, as indicated by the transcendental sound produced by the conchshell of Viṣṇu, or Lord Kṛṣṇa. 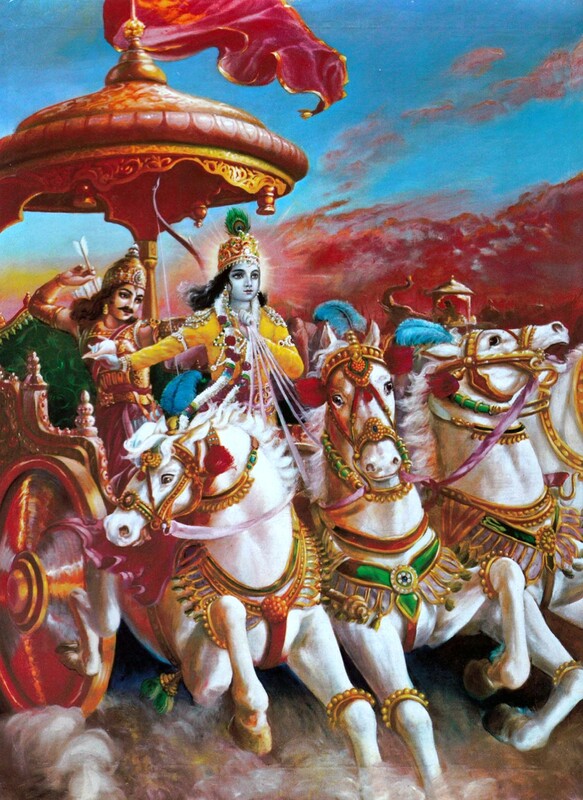 Besides that, the chariot on which both the friends were seated was donated by Agni (the fire-god) to Arjuna, and this indicated that this chariot was capable of conquering all sides, wherever it was drawn over the three worlds. Bhīṣmadeva was certainly satisfied by seeing the triumph of virtue, and he was glad to see King Yudhiṣṭhira on the throne, although he himself fought against him. Even a great fighter like Bhīṣma could not win the Battle of Kurukṣetra because the Lord wanted to show that vice cannot conquer virtue, regardless of who tries to execute it. Bhīṣmadeva was a great devotee of the Lord, but he chose to fight against the Pāṇḍavas by the will of the Lord because the Lord wanted to show that a fighter like Bhīṣma cannot win on the wrong side.